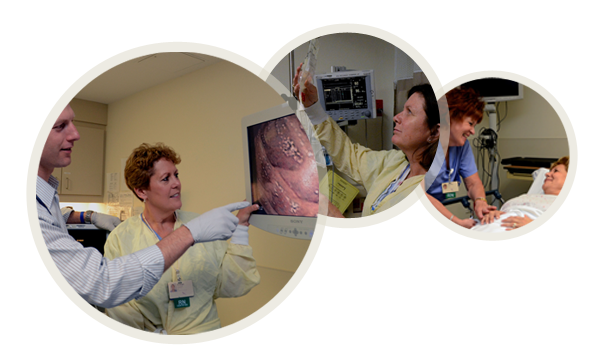 The Winchester Hospital Endoscopy Center offers endoscopies, colonoscopies and other diagnostic and therapeutic procedures related to the digestive system, in a comfortable, state-of-the-art, freestanding facility. The Endoscopy Center features 15 preparation/recovery rooms, five procedure rooms, two nurse stations, a family consultation room, lockers and separate waiting areas for patients coming in for procedures and those who have been discharged to get a ride home. The Endoscopy Center has been designed to maximize patients' comfort. We can accommodate 15 patients in individual preparation and recovery areas, ensuring a private and restful experience that is an essential component of providing patients with the highest level of care possible. The center is located at 10P Commerce Way in Woburn. Get directions. The hours of operation for the Endoscopy Center are 7 a.m. to 4 p.m. The facility also has the latest scopes and other state-of-the-art diagnostic equipment, as well as a complete array of support services including registration, assessment and supply rooms. The latest version of the EndoSoft medical imaging software – enabling physicians to electronically document findings during the course of procedures – is used at the Endoscopy Center as well as at Winchester Hospital's main campus at 41 Highland Avenue in Winchester, where inpatient digestive procedures continue to be performed. To learn more, call Winchester Hospital's Endoscopy Center at 781-756-7670. A full range of coordinated cancer services in a single location.